The Dunwoody Wildcats head to Jekyll Island on Sunday for Monday’s (May 21) 2018 GHSA Class 6A Boys’ State Golf Championships set for 8:00 am at Pine Lakes Golf Club. 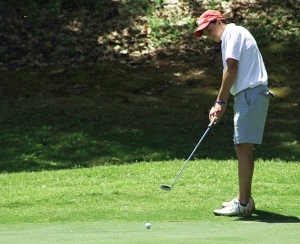 Dunwoody qualified for the state championship via its third place finish in the recent Area 3-6A Tournament. The Wildcats shot a team total of 316 finishing behind Johns Creek (299) and Cambridge (302). Jackson Perry and Patrick Caiaccio led the Wildcat charge as both shot 74 at Area to finish in a tie for third in the individual standings, just three strokes behind medalist Andy Mao (71) of Johns Creek. Nick Trembath and Cole Pickering both recorded an 84 to tie for 19th to close out the four-man scoring for the Area Tournament. Ben Warren (85) was tied for 22nd and Elijah Dwoskin shot a 90 to tie for 34th. The Chamblee Bulldogs came up short of qualifying for the Class 5A State Championship, but shot a solid 365 in the Area 3-5A Championship to finish fourth overall behind Buford (320), Flowery Branch (342) and Loganville (361). River Harper’s round of 83 was good for a tie for fifth on the day. Phillip McCrery (93) was 16th, Jimmy McClendon (94) was 17th and Carson Cooper (95) rounded out the team scoring also finishing in the Top 20 at 19th overall. Parish Priester (103) was in a tie for 24th and Kwezi Fleming (109) finished 29th overall. The only other full boys’ team to compete in area play was the Lakeside Vikings which shot a 402 to finish ninth in the Area 4-7A Tournament. Marist Ratanavong was the top Viking as he finished 33rd with a round of 95. Austin Garlow (100) was 35th, Hayes Guzman (101) was 36th and Joe Helenbrook (106) was 40th to complete the team scoring. Lakeside’s Kaylee Cornelius swung her way to a DCSD best 13th place finish in area competition. She shot an even 100 in the Area 4-7A Championship. The Lakeside Lady Vikings were the only full girls’ team to qualify for an area title as they finished eighth in Area 4-7A with a 332 total. Kaylee Cornelius (100) and Jayla Cornelius (102) both finished in the Top 15 at 13th and 15th, respectively. Ivy Saddler (130) was 28th overall to round out the scoring. Druid Hills had a pair of girls compete in the Area 3-4A Tournament with both finishing in the Top 25 even though the Lady Red Devils did not have enough to qualify for the team scoring. Cate Moore (134) came in at No. 24 while teammate Hailey Crosby (137) was in a tie for 25th. Redan’s Kameron Robinson was the only girl to go 18 holes in the Area 3-3A Tournament. Robinson carded a 120 to finish 31st overall in a very tough area tournament.